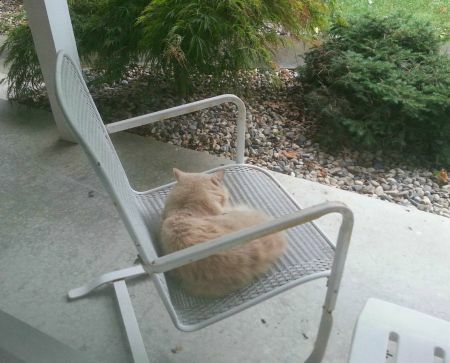 I’se sitting in your chair on your front porch, catching some zzzz’s. Quite comfy, you know, because you can’t get at me. So bark and growl all you want, y’hear?? This entry was posted in Uncategorized and tagged cat sleeping, cat teasing dog. Bookmark the permalink. Thought you’d like this furry feline, my dear! Love you bunches!! Hey, Dawg. Want to rent a newspaper? Poor Dallas. Yes, he’d love a newspaper so he could whack the tar out of this fuzzy intruder! There are dog days, but it’s a cat’s world! I believe you’re right, Linda. Cats, for sure, know how to catch a nap in the sun — regardless of the surroundings. And knowing poor Dallas was watching from the window didn’t seem to faze Kitteh one bit! Now, that looks like a very content cat. Poor Dallas. Cats are such masters at ignoring you. I still can’t figure out how this feline could sleep while Dallas was making such a ruckus inside! Is that a neighbor’s cat? I don’t blame Dallas one bit for not being happy about this development. My dogs would go crazy seeing a cat in our patio. Though once, long ago an opussum tried to. But that was before Henry or Oliver were around. Yep, it’s the neighbor’s cat (one of several, actually). Dallas can’t stand the thing, and invariably, it sets up home right where my poor Sheltie can’t reach it! Perhaps Henry and Oliver need a trip east so they can help run Kitteh off??!! Cat have such attitudes! LOL! Can’t your dog just jump on the chair? Well, the chair is on the front porch, and Doggie doesn’t go out there without a leash. The minute I’d try to take him out, that cat would scoot out of there in a hurry! Was Dallas very cranky about it? *laughs* Nice cat, though. Dallas hates cats. All cats. So yes, he was very cranky. He wanted to get at that cat in the worst way! You should’ve let him out! Oh, no, not at all! He was in “attack mode,” if truth be told, though I’m not sure he just didn’t want kitteh gone! !